All natural, No hormones, No steroids, Grassfed and Finished. Raised on their mother’s milk as well as the forage they eat in the pastures. We also feed them supplemental hay as necessary during the winter. We do not use any hormones, steroids, antibiotics, performance enhancers, etc. We also do not use any chemical pesticides or fertilizers on our pastures. We strive for a natural, organic environment. 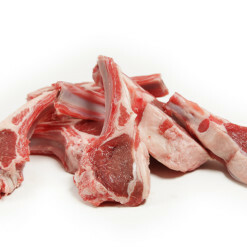 100% grass-fed American Lamb, and it makes a difference!